Before we left Jolly Harbour, Antigua for the last time, we took down the screecher sail (the big beige color jib sail on the front bow sprit) in order to prepare for spinnaker sailing. 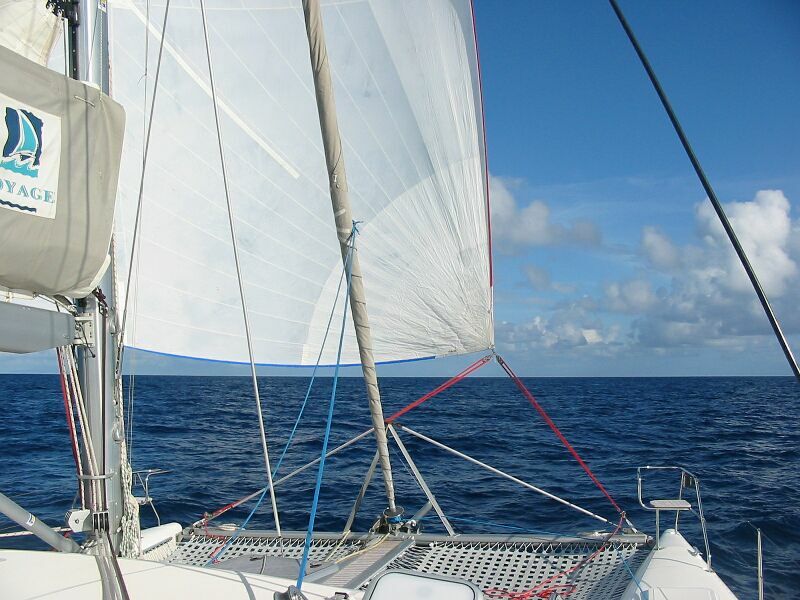 For the first time in the Caribbean, we would be doing real downwind sailing. This normally means for very pleasant sailing since going down wind usually means you are with the waves, and the breezes are just the amount of wind you get that is faster than the speed of the boat. 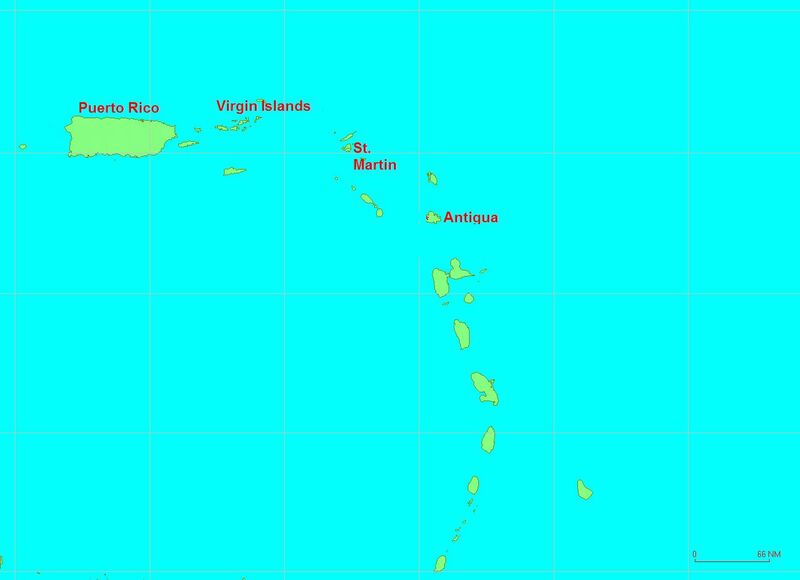 Our trip from this point all the way to Florida should mostly be down wind since the prevailing tradewinds in the Caribbean and the Bahamas are from the East-South-East (ESE). We got up a bit before 5 AM on June 1st and weighed anchor and were motoring out of Antigua for the last time. We had light winds, so it was mostly motoring for a couple of hours while we waited for the sun to heat things up. We called Hotel California at 6 AM as we had arranged. Since they had left at midnight (to take advantage of their four kids being asleep) they were 25 or so miles ahead of us. It turns out they had one more parting gift from Antigua before they left. They had only gone half a mile when an unlit boat approached them during the night. After initial concern about possible pirates, it turned out to be the Antigua Coast Guard. They boarded HC and did a quick inspection. It turns out one of the Guard had been on HC when they had their accident 3 months earlier, and so he told the others to hurry it up. HC's crew were amazed to have one last parting shot from Antigua after all their troubles there. Anyway, once we got to the edge of the shelf off Antigua, Frank dropped some fishing lines. Frank had waited so he would avoid catching Barracuda in the shallower waters. About 15 seconds after dropping the second line, he caught a Barracuda! Se la vie. Then he caught a couple of Atlantic Mackerel in succession. A little after 7 AM, the winds had picked up to a bit over 10 knots. Frank and Karen prepared the spinnaker. It took about 20 minutes since we hadn't flown it since Bermuda. We finally got it up and it was BEAUTIFUL! It's such a fun sail to fly. Initially we were going less than 6 knots, but then the winds picked up and before 10 AM we were going as high as 8.9 knots. Here's a picture of us flying the spinnaker. Such a pleasure to behold. The size is hard to grasp in the photos, it's really big. The rest of the morning and early afternoon was pleasant downwind sailing with soft easy seas, beautiful sunshine, and light breezes on the boat. Frank was tweaking the sails and boat to optimize our speed - like any good sailor. There wasn't much fish activity during the middle of the day in deep waters. 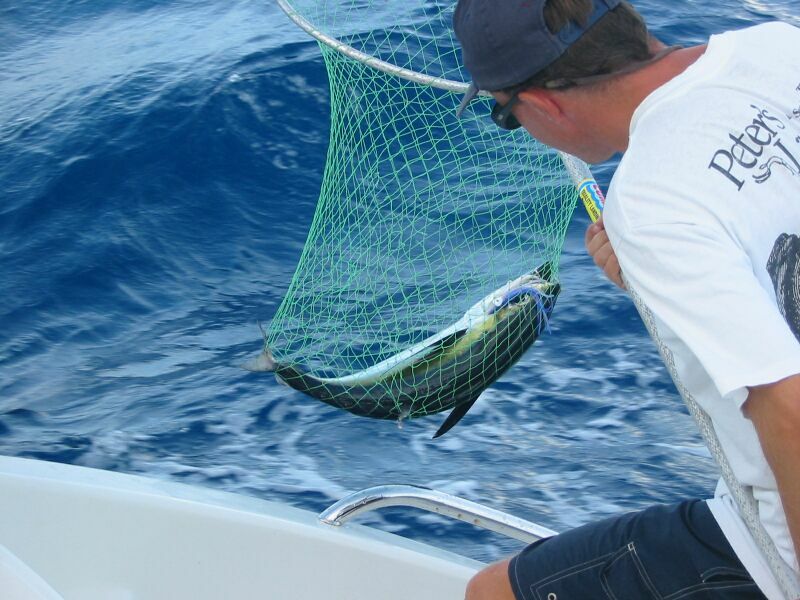 When we got to the shallower banks surrounding St. Barts, the fish started getting interested in our lures. We had a big bite on the starboard side, but it got away. So, Frank changed to a bigger lure. Then, we had a big bite on the port side. Frank played it a while, it had almost all the line out. As soon as he tried to bring it in, it gave a mighty pull and snapped the line. Sigh. A few minutes later, we had another hit on the starboard side, and we could see the fish jumping out of the water as we hauled it in. We got a nice sized black fin tuna. Patricia even took pictures on video of this fun catch. 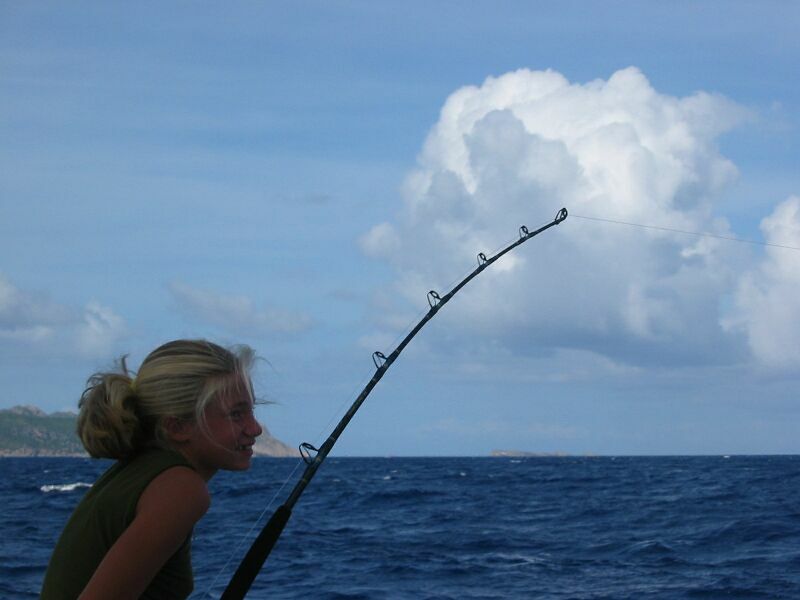 Here's some pictures: one of Patricia working one of the lines (with St. Barts in the background), and then the tuna brought aboard. 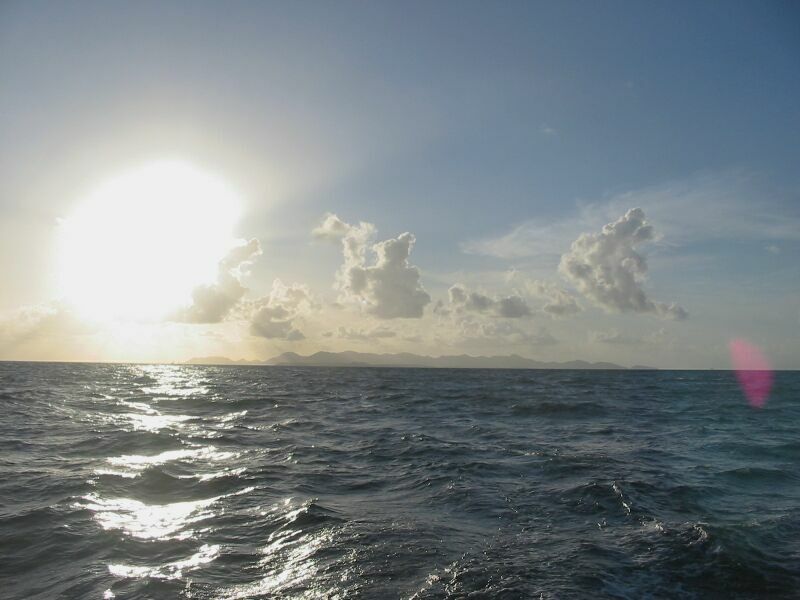 We kept on sailing towards St. Maarten until we were about 20 minutes out as the sun was setting. 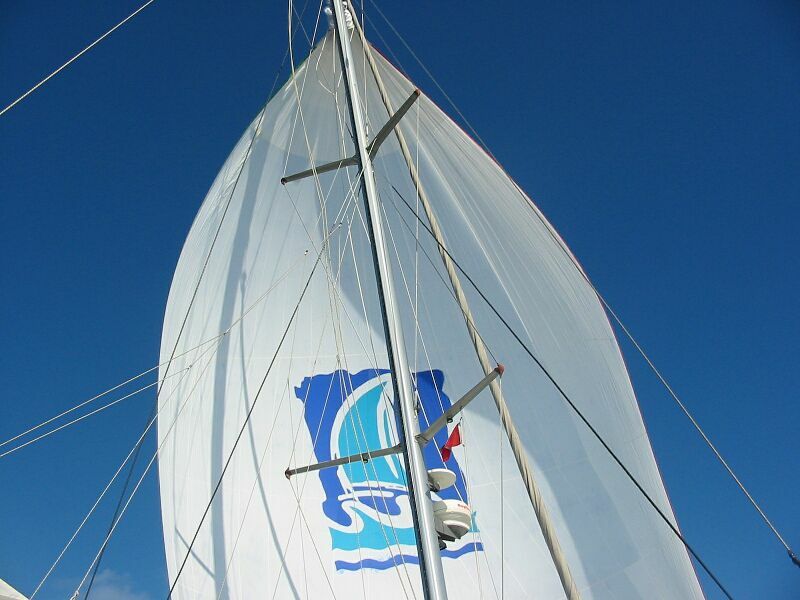 We got the Spinnaker down without any problem and then motored our way into Simpson Bay. We arrived at 5:45 PM after 88 pleasant miles of sailing. Of course, the first thing we all wanted to do was to go see what was showing at the movie theater. Frank and Karen went to see Matrix Reloaded (R rated) and the girls watched Bruce Almighty. This was our first movie at a theater since the last time we visited St. Maarten last February. The next morning, Frank prepared some E-mail for transmission ashore. Then he went ashore to first clear customs. We had heard all kinds of reports of new customs fees because of the new bridge at Simpson Bay, but the rates hadn't changed it all. It cost just $8 US. We were going to take PatiCat into the lagoon through the bridge, so we waited until 9:30 for our turn. We got in and dropped anchor. Karen and the girls did home schooling, and Frnak went ashore to do the E-mails at the nice Internet Business Center with high speed Internet. Later, Frank went and shopped at the big chandleries (marine stores) and got some much needed items. We again went to see a movie that night. The last full day there, we all spent some time ashore. The girls bought some more dolls to play with, and Frank went to the IBC and uploaded more E-mails and downloaded weather data. Frank made a couple of phone calls as well. Karen and Frank caught a bus and went to Phillipsburg. Frank got new walkie talkies there, a watch, and a joystick hoping he could practice some flight simulator before getting home. Karen did some grocery shopping at the big grocery store there. Frank tried a few places for a spare alternator belt, but still couldn't find one. We went back out through the bridge at 4:30 PM and anchored in the Bay. This was so we could leave early the next morning for the Virgin Islands. But, first, we wanted to go see one more movie. This time, we saw the Italian Job. We pulled up the dinghy when we got back and went to bed. The next morning, we got up for a 5 AM departure for the Virgin Islands.